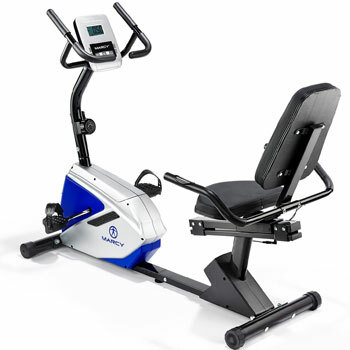 Recumbent exercise bikes have two clear benefits for two groups of users. On one hand, there are those that struggle with regular exercise bikes due to mobility issues. A low frame and wide, recumbent seat are more appealing to the elderly and disabled because of the comfort and support. Then there are those that want the chance to push themselves through tough workouts, without having to suffer the hard, upright seats of typical machines. 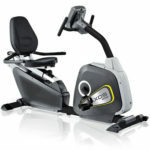 What features should we look for in top rated recumbent bikes? Many consumers will look at the seat first. Some models are more adjustable than others in regard to the distance from the pedals and the back support. The width and quality of the padding are also important. Then there is the flywheel and the amount of resistance offered. There is a big difference between some of the best machines. Some are light with a few settings while others are more extreme. The more settings, the further you can progress. Finally, diversity in settings also comes from the computer. Look at the programmes offered and the data achieved. Are there heart rate sensors and can it connect to apps? 5 top rated recumbent exercise bikes to consider. Quick access controls are always helpful on any exercise machine. Here the designers at JTX have done just that with side saddle workout controls. This means that users don’t have to give up that comfortable recumbent position to alter their workout options. This comfort continues with the smooth motion from the 17kg flywheel and the position of the water bottle holder. Users can focus on their movements without straining to change the resistance or rehydrate themselves. This should allow for better times and user experiences. Another interesting selling point on this JTX CYCLO-5 Recumbent Exercise Bike is the self-generating power mode. This means that users can power the console with their own efforts. This also allows users to place the machine away from outlets. 16 resistance levels and a great workout mean it shouldn’t be too difficult for users to find the best setting to keep that display running. 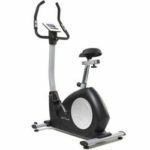 The first thing that is noticeable with this Kettler Premium Recumbent Exercise Bike is that the frame is so low compared to some other top rated recumbent bikes. In fact, the seat area and flywheel almost seem like they are completely separate. This is to ensure that users with low mobility are able to step on and off with ease. This, plus the comfortable seat, means that this appeals to older and disabled users. There is clear attempt to cater to the less able user here. However, that doesn’t mean that there isn’t a decent workout available. There is enough of a range of resistance for users to challenge themselves, but there is nothing intimidating about the design. There are 12 programmes to choose from, with with option of a chest strap for heart rate modes, and a simple data display. 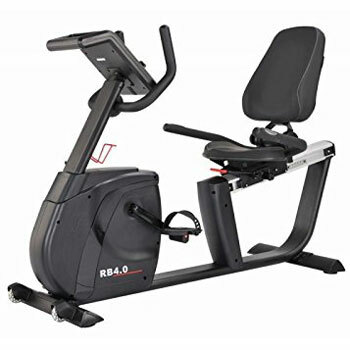 Regular sessions on this bike machine could help many users improve mobility and fitness. It is all about comfort with this Marcy Azure RB1016 model. The selling points for less able users are the amount of padding in the wide, recumbent seat, the seat adjustments for different heights and the flip-out stand for a mobile device. Users can get comfortable in the right position, catch up on some television and work their leg muscles for as long as needed. The settings and workout options are minimal, so there isn’t really that much room for progression. There is a small 4kg flywheel, 8 resistance settings to work through and a basic console. Yet, it should be just what newcomers need for a little light movement. This all puts the physical effort and workout down a peg in terms of priorities. 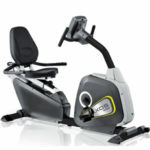 This isn’t for the fitness fanatic, but the more unsure user that may prefer a model with some distractions. Compared with the simplistic Marcy Azure above, this DKN DKN RB-4i model actually has a lot going on. The flywheel is much heavier at 11kg, there are an impressive 32 levels of resistance and there are 12 programmes. Among the programmes and settings are the chance to test out heart rates for the grip sensors and compatibility with DKN Apps. These apps are great for those that want a little more diversity in their weekly regime. The 4 user profiles show that this is designed to be adaptable for all members of the household. 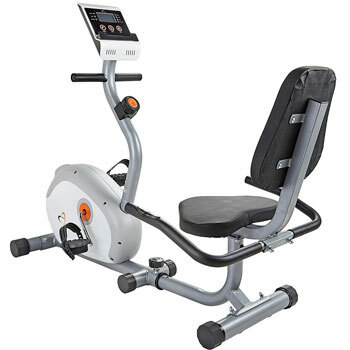 Therefore, this is a gym bike that leans more towards that fitness angle than rehabilitation. The recumbent seat is purely a choice for added comfort, not one the main features. Still, that doesn’t mean that it is a complete afterthought, as it is still comfortable and adjustable. 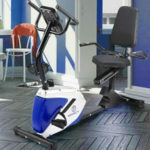 Additional features of interest include the transport wheels, straps on the pedals and adjustable back support. This V-Fit G-RC Recumbent Magnetic Cycle is one of the more affordable options for those on a budget. The downside is that it looks like a budget model, with the shape of the frame and style of the seat and flywheel casing. Some of the top rated recumbent bikes above are more visually appealing. However, there should still be enough here to help out new users. The 6kg flywheel isn’t the weakest in this list, and there is a simple manual dial to adjust the magnetic resistance. This allows for a small amount of progression as users improve upon their best times. Then there is the seven function console that provides information on the workout. This includes the basics on speed, time and distance. Finally there is the large, adjustable chair with an impressive 18 stone weight allowance. This should all combine to create something effective for inexperienced users. 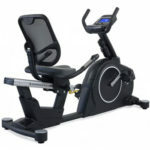 Choosing between the best top rated recumbent bikes. The models in this guide highlight two different ends of the scale. At one end there is the weaker, budget model that is perfectly accessible for those with limited experience. At the other end, there are other designs with greater consideration for the different workout options, resistance levels and settings. Some focus on fitness goals while others target users with mobility issues. All models share a need to provide a comfortable, recumbent workout for the target market. Consider your needs and experience levels and compare models for the best device for your home.